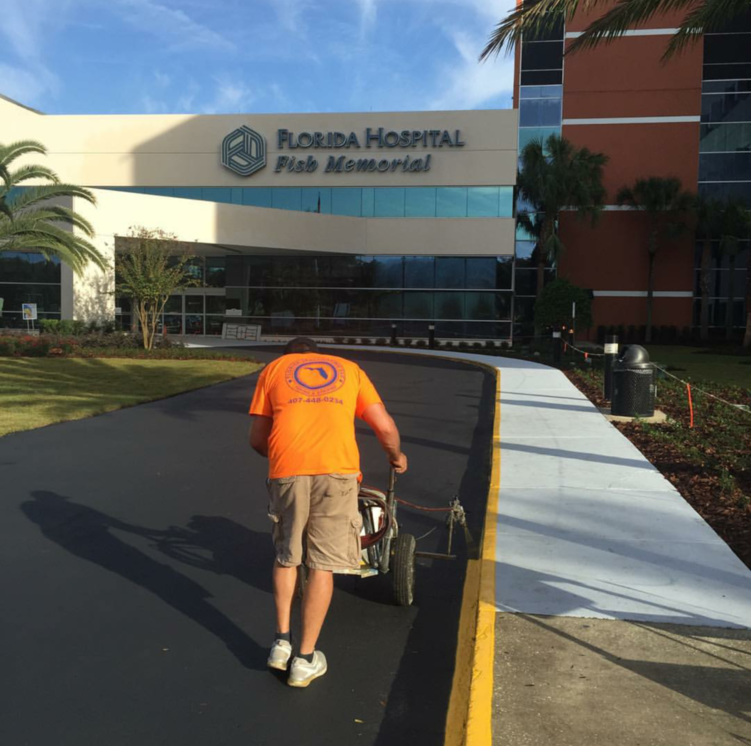 Florida Sealcoating, LLC, has proudly offered high-quality asphalt services to residents, corporations, property management companies and H.O.A. organizations of Central Florida for over 15 years. Our services include asphalt paving, cleaning, striping, pressure washing, sealcoating, concrete curbing, and signage. We use the latest cutting-edge asphalt materials and equipment that exceed industry standards to ensure longevity and beauty of your project. Our company is fully licensed and insured, and we have an extensive list of references available upon request. 90% of our customers are repeat customers, and since we mostly gain new customers through referrals, this is an outstanding achievement for us. We perform all jobs with the highest possible level of dedication, attention to detail and care, because we are focused on your complete satisfaction above all else. However, we do stress an open line of communication during your initial estimate and throughout the duration of your project because we want to make sure you understand exactly what your project will require. Reach out to Florida Sealcoating, LLC, for your free estimate today! We would be happy to educate you on your property needs and development opportunities. Every project is important to us. Regardless of its size and scope, Florida Sealcoating, LLC, throws the full weight of its team behind your project to deliver the results you've come to expect from us. We place a high premium on flexibility and dedication. Our first priority is to deliver what we promise, and we fully understand the importance of deadlines and budget limits. Our team shares a passion for cost-efficient solutions and long-standing expertise in the field. Building a long standing relationship is very important. We pride ourselves on the fact that 90% of our customers are loyal to only us and that they will use us again and again. Our customers know they can count on us for all of their asphalt needs. This philosophy has served us well in the past, and it's what distinguishes us from all of our competitors. Contact us today, and see how a lasting relationship with Florida Sealcoating, LLC, will put your mind at ease. Are your stripes faded and hard to see? Do you need more handicap spots or regular parking stalls? Are your handicap stalls ADA Code Compliant? Do you need a no-parking zone? Are your car stops broken, missing, or out of line? When you look at your asphalt is it white and oxidized? Does the asphalt look rough and not uniform? Do you have oil, gas, or any other petroleum based product spots on your asphalt? Do you have have large cracks? Do you have pot holes that can be harmful to vehicles or pedestrians? Do the driving or parking areas have low sandy spots that hold water? Do you have curbs that need to be painted or repaired? Is your concrete entrance cracked and breaking apart? Has it been 2-4 years since you last sealcoated? Do you have heavy traffic flow? Do you have heavy equipment or vehicles driving through or parking on your asphalt or concrete? If you answered yes to any of these questions or have any more, you may want to consider giving us a call! All estimates and education is free!